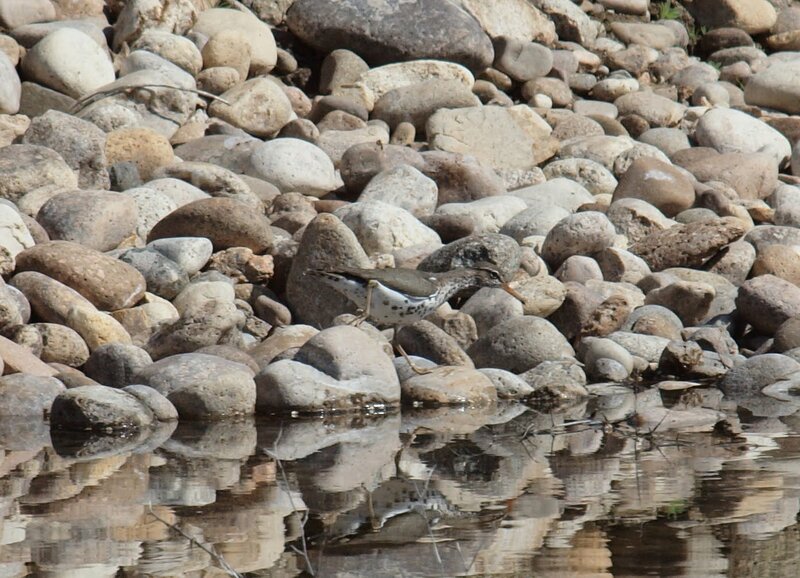 Every year I get a couple Spotted Sandpipers at Avimor's Town Lake. Tuesday evening, I had three. Wednesday morning I went back and there were four! They are fun to watch as their tail ends are constantly bobbing up and down. This time of year, you can really see why they have their name. 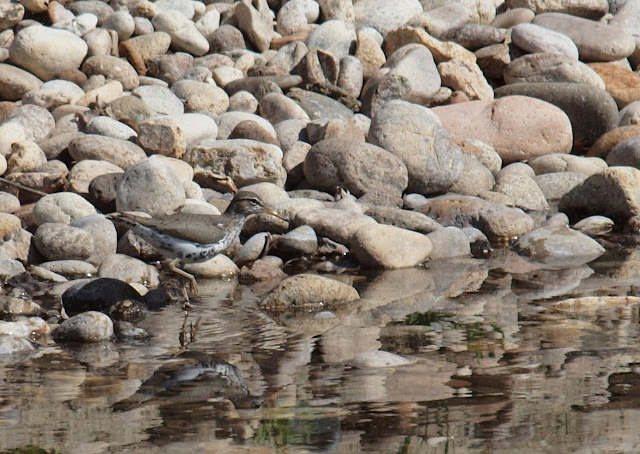 Those spots on the clean white breast make it easy to distinguish from other sandpipers. I also discovered that they have a cool sounding call while in flight. With only a 150mm lens, I had to sneak up behind a rock near the waterfall to get these shots...but I still wasn't as close as I would have liked. The sky was overcast and there wasn't any warm evening light. The next morning in better light I took more photos, but the sandpipers blend so well with the rocks that they just don't jump right off the photo at you. Who am I to be a photo snob?! I was birding and the photos were secondary anyway. The foamy bubbles in the water must be from the chemical treatment to keep the algae down. We did a lot of research a couple years ago to find the right chemical mix that would not harm the fish, birds, or insects, but still slow down the green slim. It seems to be working okay. 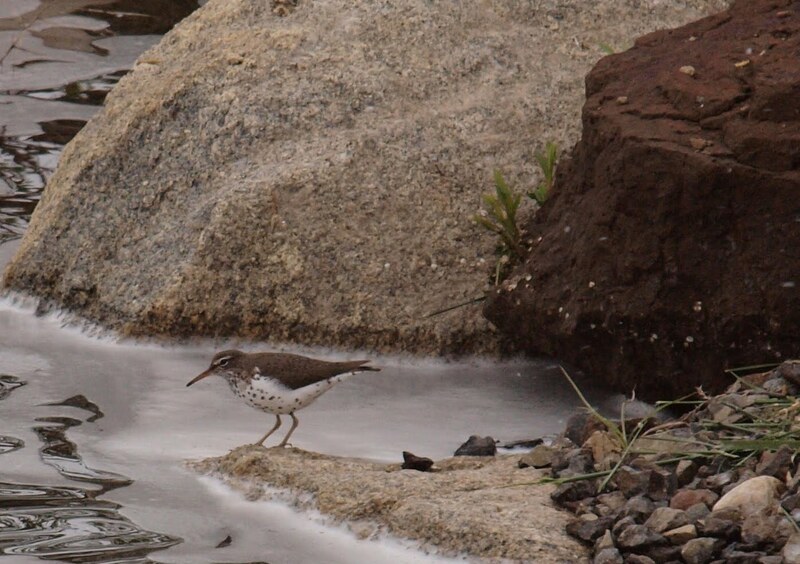 Check out this leg extension which makes me wonder about the hip joint on Spotted Sandpipers. 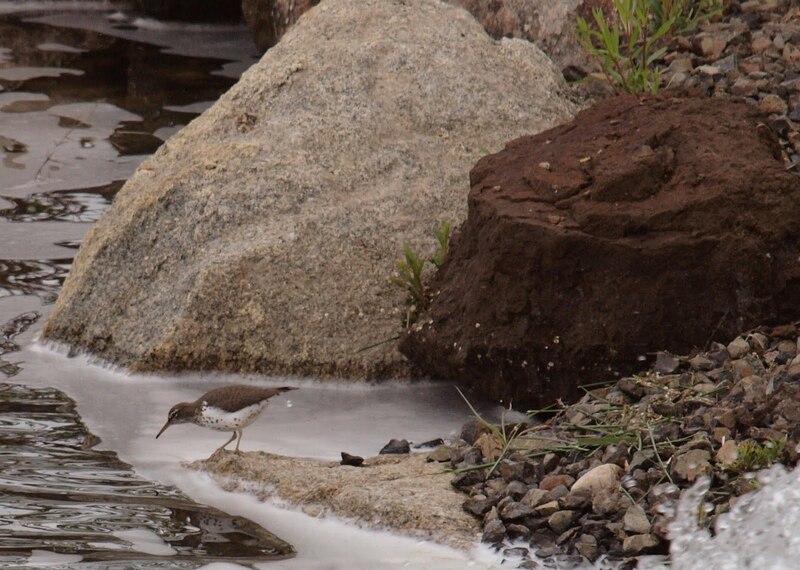 However it all goes together, it sure works well for scaling over rocks along the shore. On interesting fact from Dennis Paulson's Shorebirds of North America: The Photographic Guide is that the females defend their territory from other females and females mate with more than one male. Additional role reversal is noted in that the males furnish all parental care. 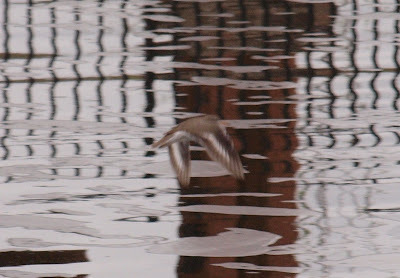 Below are some fuzzy photos, but I post them because they do show what I wanted to share about identifying Spotted Sandpipers in flight. 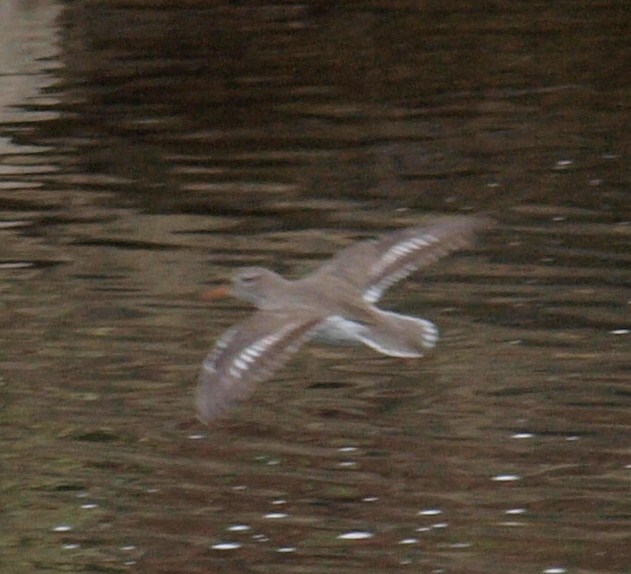 You can see the white wing patches and white tail edges. Great post! I "spotted" one of these last weekend and wasn't qutie sure what it was. You've helped me ID it. And I too was intrigued by the sounds they made while in flight skimming the water ~~ was quite a sight to see. That is some weird hip action. Thanks for sharing these. Very clear pictures of the Spot Sand. there was one near here just last week but I didn't twitch it. Thanks for posting those pictures Robert.